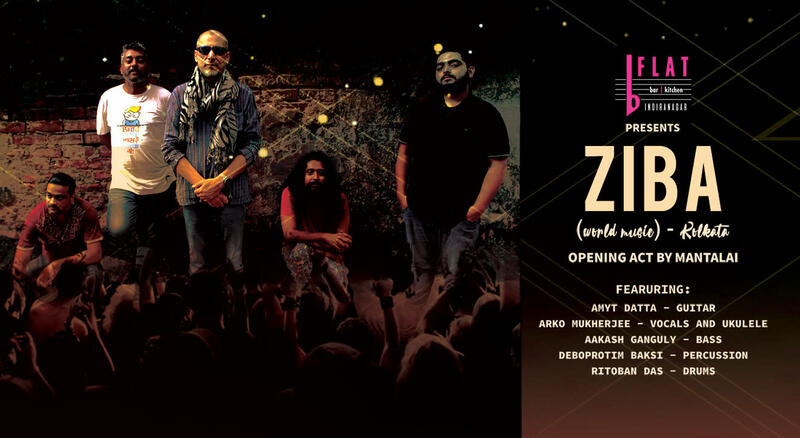 Conceptualized and led by virtuoso guitarist and musician Amyt Datta, Ziba is a five piece experimental world music band from Kolkata consisting of Arko Mukhaerjee on vocals and ukulele, Aakash Ganguly on bass, Deboprotim Baksi on percussion and Ritoban Das on drums. Amyt Datta's last concert at bFLAT had people spilling out of the doors - so revered is this guitar legend. Ziba in Persian refers to strength, unity and beauty; or a common movement for welfare. Rather fitting for a band to have such a name when their music unites the world as it tells tales of lands far and near – from Mali to Kolkata, France to Latin America, and from the Middle East to tribal Bengal. Their music is powerful, stirring - a multilingual melting pot of big aggressive grooves and sometimes complex harmonies with undertones of roots from around the globe. Guitarist Arjun Chandran's new project Mantalai, is a four piece band from Bangalore with a Bengali guitarist, a Malayalee drummer, a Gorkha bass guitarist and a Telugu singer. The band plays electric folkloric music that draws from a vast reservoir of traditional Indian sounds. One could describe the band's sound as truly independent, original music because it's as traditional as it's contemporary. Or even that it's truly original because it's inspirations are from the diaspora of Indian folk traditions but the musicians themselves are young, urban, contemporary! ..."The bar was packed. There was an excited buzz in the air. The band took to the stage to thunderous applause and their first song transported us back 600 years, to the time of poet and saint Kabir through the song ‘Ud Jayega’, re-christened ‘The Kabir Jam’. Arko’s free falling, far flung voice paid homage to the poet as an oriental rhythm took root. The guitar solo, however, flew out of that soundscape like an alien being, injecting its musical tentacles into the root, and eventually becoming part of it. Africa called out for some love through two different lands. Mali was toured through ‘Diaraby’ and ‘Moussolou’ of Oumou Sangaré, while Senegal reached us through the warm and easy feels of Baaba Maal’s ‘Cherie’. Insanely infectious rhythms took hold of everyone... The powerful, vibrant drums and the funky, blurry bass created an overpowering sonic bed, while the guitar sprinkled on some magic fillers. Drawn inside it, the percussion played a plethora of notes, catching everyone in a spell, while the vocals bound it all together. A beautiful surprise was ...... a trip to the evergreen land of Satyajit Ray through ‘Dekho Re’. The track has been imagined in an outlandishly different flavour – like an exotic beauty, almost forbidden. One could ......imagine being in a magical forest, dark and fearful, but strangely welcoming. The soundscape felt like it was made of dark matter, growing bigger and enveloping the space gradually through each bar; until finally, the guitar sprang out of it like a mighty beast rushing straight out of Hades’ haven. This dark intensity, which left everyone speechless, was followed by an enchantingly peaceful release. ‘Couleur Cafe’ ... a slow delight, bringing lazy smiles all around. On a funky, progressive soundscape, the rural ‘Allah Megh De’ and the Latin ‘Gypsy Queen’ were juxtaposed. ..... Rapid and wacky percussion solo was followed by roaring and unconventional drumming, but when the guitar took it up, all hell broke loose! ..."
Amyt Datta: Guitarist extraordinaire, composer, producer, teacher for almost thirty eight years, he has travelled extensively and recorded and performed with the likes of Louiz Banks, Pam Crain, Ranjit Barot, Latin percussion master Monojit Datta; been a part of nationally popular bands like Shiva, Pop Secret, Pinknoise, Skinny Alley, etc. Amyt has recorded several albums of his own music to date and he has a huge following of musicians and fans both in Kolkata and across the country. Arjun Chandran is a very respected guitarist from Bangalore who returns to the city's stages with his new project Mantalai (the source of the river Parvati) after having been away for the past 2 years, working on his compositions, travelling, touring in France where he performed music Live for a series of movement art-theatre productions. He presents Mantalai in collaboration with 3 very talented musicians. The sound is powerful, rooted, very Indian and organic and yet electric - a perfect balance of tradition and urban-contemporary. Just back from a tour of the North East, the band has a fresh and raw approach drawing from the depth of our folk music and theatre heritage, artfully interpreted and represented with a mix of earthy vocals and skilled slide guitar riffs, coupled with creative rhythms, time signatures and solid bass lines.